Renal biopsy is the choice of investigation for renal parenchymal diseases, especially glomerulopathies. Its safety and importance has been reviewed repeatedly. It has an indispensable role in the diagnosis of glomerular, vascular, tubulointerstitial, and genetic diseases. It gives vital information which helps in estimating the disease prognosis, progression, and management. The indications of performing renal biopsies are divergent and differ from one center to another. The evaluation of the epidemiology of biopsyproven nephropathies helps not only in understanding the incidence and prevalence of different kinds of kidney diseases but also gives information of changing pattern of pathology over the time and regional variation and differences within, and outside the country.,,,,,,,,,,, On the other hand, it is difficult to take any inference from the international registry’s data, as we saw a profound variation in the outcome., This emphasizes a need for a regional registry or more precisely a central renal registry of a country. It is sad to say that we do not have a central registry in Pakistan and data about the kidney biopsy are sparse. The aim of the study is to report the frequency of different pathological lesions and their clinical manifestation in a single-center tertiary care unit. We will also compare our data with the local and international data, to see any concordance or discordance and will try to find the reasons of the differences if any from our data to the international data. We analyzed data of all patients who underwent percutaneous renal biopsy at The Kidney Center Post Graduate Training Institute (PGTI), Karachi, over duration of 18 years, i.e., January 1, 1996, to December 2013. Since the institute has taken care of poor patients through a Welfare system, patients from all socioeconomical groups seek consultation at The Kidney Center PGTI Karachi. The study included all adult patients aged above 18 years were biopsied during the study period. Renal graft and inadequate biopsies were excluded from analysis. The samples were processed on routine standard protocols, and light microscopy and immunofluorescence were performed on all biopsies; however, electron microscopy was not done due to unavailability of the facility at our center. The indication of renal biopsy was categorized with seven clinical syndromes such as nephrotic syndrome (NS), acute nephritic syndrome (ANIS), acute renal failure (ARF), rapidly progressive glomerulonephritis (RPGN), hematuria (H), asymptomatic urinary abnormalities (AUAs), chronic kidney disease (CKD), and nonnephrotic proteinuria (NNP). Tubulointerstitial nephritis disease includes acute tubular necrosis (ATN), acute interstitial nephritis, chronic tubulointerstitial nephritis (chronic TIN), and acute pyelonephritis. Vascular nephropathy included acute cortical necrosis (ACN), benign nephrosclerosis (B Neph). Miscellaneous group included are case of lymphoma and Alport syndrome. We performed 1962 renal biopsies and incorporated 1521 in our assessment. The mean age of the population was 38 ± 15.26 years (range 18–88 years). The gender distribution showed a male preponderance, i.e., 920 (60.5%) as compared with the female, i.e., 601 (39.5%). The number of biopsies executed during this period (1996–2013) increased progressively but not consistently [Figure 1]. 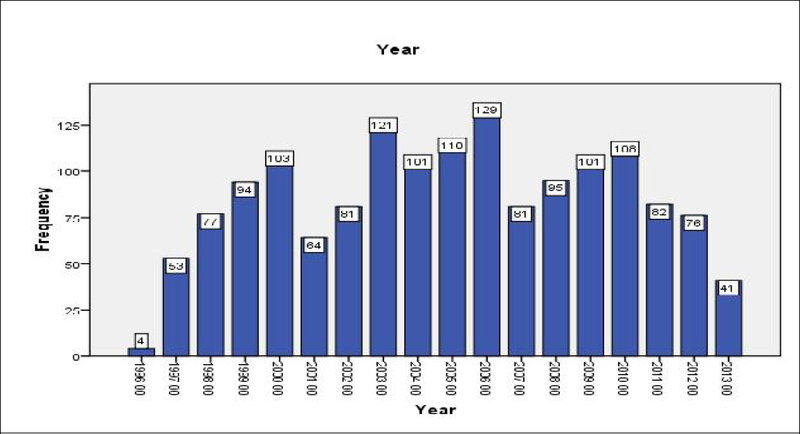 Figure 1: Frequency of renal biopsy done in span of 17 years. The most common clinical indication was NS - 741 (48.72%), followed by CKD - 253 (16.63%), ARF - 184 (12.10%), RPGN - 124 (8.20%), and ANIS - 122 (8.02%), while in few of the patients biopsy’ was performed for AUA - 70 (4.60%), hematuria - 19 (1.25%), and NNP - eight (0.53%) [Figure 2]. A further detail of the clinical syndrome underlying in each histological category showed that most of the primary and secondary histological diseases, i.e., 704 (58.5%) presented with NS, whereas tubulointerstitial diseases mostly presented with with chronic 118 (52%) or acute 64 (28%) kidney injury. None of the patient presented with hematuria except IgAN and only FSGS (2.7%) presented with NNP [Table 1]. Table 1: Frequency of various pathological lesions with different clinical presentations. NS: Nephrotic syndrome, ARF: Acute renal failure, CKD: Chronic kidney disease, AUA: Asymptomatic urinary abnormality, ANS: Acute nephritic syndrome, H: Hematuria, RPGN: Rapidly progressive glomerulonephritis, NNP: Nonnephrotic proteinuria. 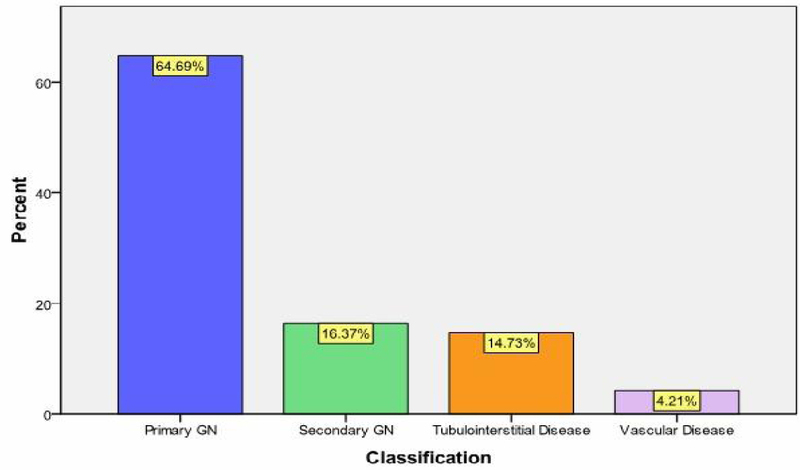 Primary GN was found in majority of the patients, i.e., 984 (64.7%), and it was the most common renal disease found in biopsy, followed by secondary GN in 249 (16.4%), tubulointerstitial disease in 224 (14.7%), and vascular disease in 64 (4.2%) [Figure 3]. Figure 3: Major classification of renal diseases. In primary GN, FSGS was the most common histopathological diagnosis in 297 (19.5%) patients, followed by MGN in 224 (14.7%), chronic GN in 98 (6.4%), crescentic GN in 93 (6.1%), MCD in 87 (5.7%), MPGN in 58 (3.8%), and PIGN in 53 (3.5%) patients, while some of the patients showed IgAN in 40 (2.6%), FPGN in 24 (1.6%), MesPGN in 10 (0.7%), and IgMN in four (0.3%) patients. Secondary GN, i.e., 249 (16.4%), was the highest after Primary GN. Among secondary GN, DNP was the most common lesion in our series, i.e., 86 (5.7%), followed by lupus nephritis in 72 (4.7%), AM in 48 (3.2%), HUS in 15 (1.0%), and MM in three (0.2%), while few of the patients had viral nephropathies such as hepatitis C in 12 (0.8%) and hepatitis B in nine (0.6%). Chronic TIN 146 (9.6%) was most prevalent among tubulointerstitial disease, followed by acute TIN in 38 (2.5%) and ATN in 37 (2.4%) patients, whereas acute pyelonephritis was found in only two (0.1%) patients. Vascular nephropathies were few in our series, B Neph in 31 (2.0%), vasculitides in 21 (1.4%), and ACN in 11 (0.7%) patients [Table 2]. Table 2: Frequency of different histopathological lesion. The age and gender have an effect on the incidence of kidney diseases. We reviewed the effect of age and gender on the distribution of important glomerular diseases. Almost all of the important mentioned primary and secondary glomerular diseases had a high prevalence in young males, for example, 237 (59.25%) males suffered kidney diseases compared with 170 (42.55%) females between 18–30 years of age. Exception was for lupus nephritis, which was common in females, i.e., 42 (67%) between the age of 18–40 years versus males, i.e., 20 (32%), and DNP which was more common in males, i.e., 51 (68.91%) versus females, i.e., 23 (31.08%) after the age of 40 years [Table 3]. 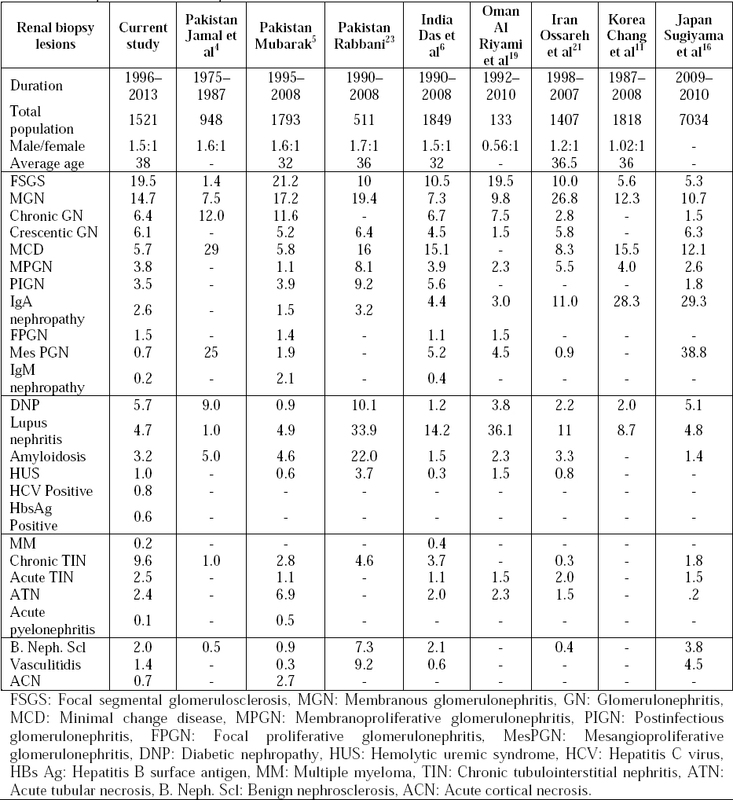 Table 3: Age and gender-specific distribution of major pathological category. This research provides an inclusive review about the demographics, clinical presentation, and prevalence of kidney diseases. Average age of the population was 38 years which is high as compared with India and other studies done in Pakistan., There is slight male predominance in our study which is comparable to the other studies except in Oman where females were higher and South Korea where male-to-female ratio was equal [Table 4]. Table 4: Comparison of renal biopsies with local and international data. Primary glomerular disease was the most common type of kidney disease in our group and NS was the most common clinical manifestation in our study. This is comparable to that reported in various other studies around the world.,,, FSGS was the most common, underlying pathology of renal disease (19.9%) in our series. Although our data are consistent with other regional data,, it is different from two studies from the same country,, which showed relatively low incidence of FSGS; Mubarak et al reported an incidence of 1.4%, this study was done around thirty years before, and a higher incidence of FSGS in our study might be time-related change observed in other parts of the world., The same trend was reported by Khan et al where the MPGN was most frequent (22.2%), followed by membranous (20.37%) and FSGS (10.6%). This study was done in the northern areas of Pakistan, and the observed difference might be due to the ethnic difference in the two regions. Membranous nephropathy was the second most common lesion in our cohort (14.7%). In fact, the incidence of membranous nephropathy is declining in Europe and North America over time, the reason of which is obscure. MGN is reportedly the top most cause of NS in Iran; it is also showed higher in one of the studies from Pakistan [Table 4]. The incidence of MCD is low in our study (5.8%) which is in contrast with India and Korea where the incidence of MCD is highest, and in Japan where it is second to IgAN. IgA nephropathy which emerges out as a most common glomerular disease in Europe, Japan, and Korea rated lower down in our series, and it is compatible with other regional data., The true incidence of IgAN in our country is not known because earlier biopsies were done without immunofluorescence. There are concerns about its unrevealed high incidence in the population, but our cohort and study from the same city does not reinforce these worries. Secondary GN was the second largest category of the patients, and DNP was the most common secondary glomerular disease in our series followed by lupus nephritis. The prevalence of DNP is high in older age group as compared with other glomerular diseases. The higher number in our study might be due to a more liberal biopsy policy for diabetic patients, and a rising incidence and high prevalence of diabetes in community causing more diabetic patient to present to the nephrology clinic. This trend is seen in other developed , countries. Lupus nephritis was a second most common lesion in secondary GN. 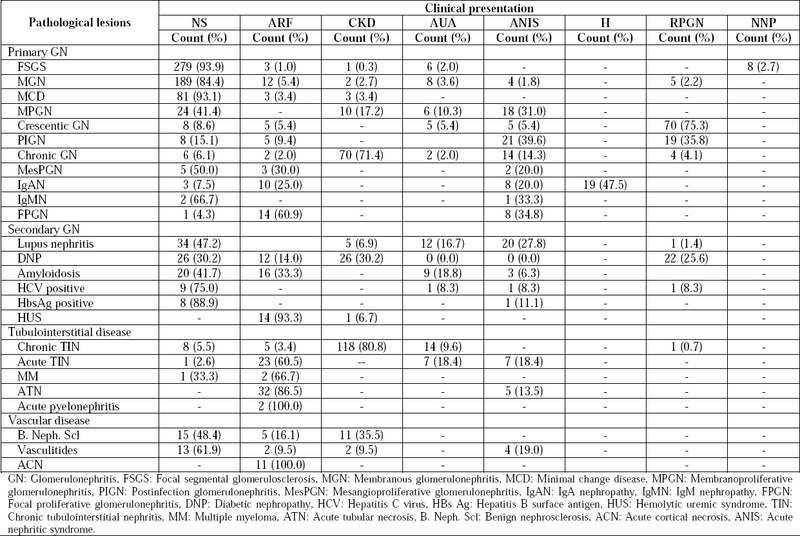 There is a higher incidence of lupus reported in American African, and it is also reportedly high in the Middle East like Saudi Arabia and Oman., Our data are comparable with other data from Pakistan; Rabbani et al reported remarkably high incidence of lupus nephritis from the same city which might be selection bias [Table 4]. AM was mostly secondary due to infections, particularly tuberculosis and chronic inflammatory condition such as rheumatoid arthritis and ankylosing spondylitis and long-standing hemiplegia. The number of patients who have secondary AM would be higher if we include those patients who diagnosed on rectal biopsies. Further classification of amyloidosis on the basis of type of protein was not done. Viral nephropathies were also relatively rare in our series although the prevalence of these two infections is high in our country. 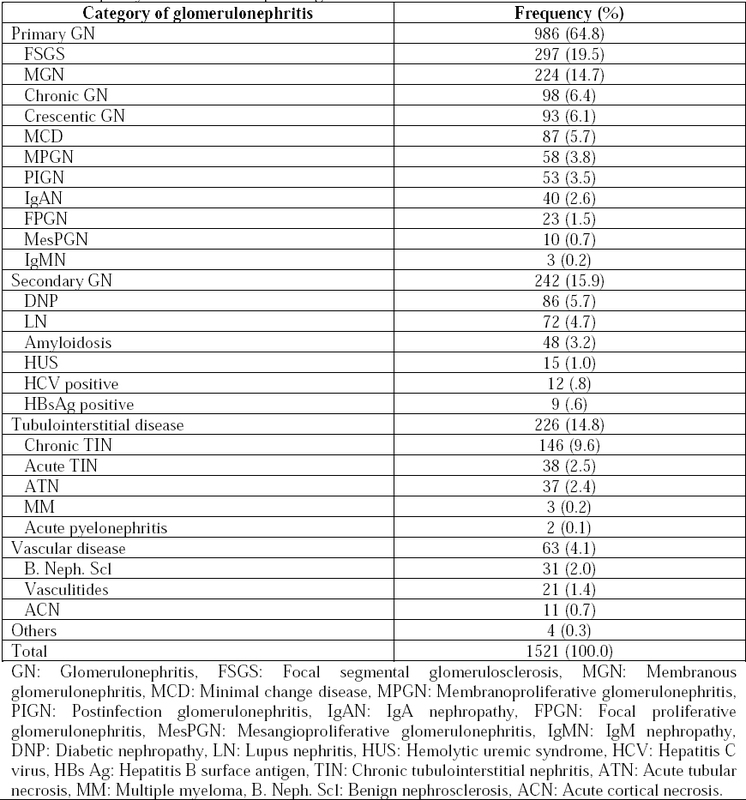 Hepatitis B was associated mostly with MGN and FSGS, whereas hepatitis C was mostly associated with MGN and MPGN, woefully none of the study from our region reported the viral association of glomerular diseases except from China. Vasculitis, which presented with focal necrotizing GN, was mostly ANCA associated, 16 (71%), whereas the remaining was immune complex mediated. In ANCA-associated vasculitis, cANCA was positive in most of the patients while few of them showed pANCA. Tubulointerstitial diseases were relatively common in our study almost equal to secondary glomerular diseases. This feature is same in other studies from Pakistan and India, which showed frequency of 11.6% and 6.7%, respectively. Chronic tubulointerstitial nephritis was the most common lesion of the category, and most of the population in the category was of older age [Table 2]. The most common etiology of acute and chronic tubulointerstitial disease was drugs, especially NSAIDS and traditional remedies, homeopathic and Hakeem’s medications. Acute tubular necrosis is relatively low although it is most common clinical condition presented to our hospital due to high incidence of infectious diarrheal illnesses, malaria and dengue fever, blood loss in road traffic accident, ongoing terrorism, bomb blast, crush injuries, and contrast-induced nephropathy. The biopsy was mostly done in those who survived and showed a progressive course and those who came with high urea and creatinine requiring hemodialysis support. In conclusion, it emerges out from this study and other local studies that in primary glomerular diseases, FSGS is the most common lesion in renal biopsy among the young age group followed by membranous nephropathy. DNP and chronic interstitial nephritis are a dominant secondary pathological lesion in older age group, whereas lupus nephritis is the most common secondary disease in young age females. We acknowledged Mr. Mohammad Zafar and Mr. M. Ali Qureshi, for their help in preparing and arranging the manuscript. Tøndel C, Vikse BE, Bostad L, Svarstad E. Safety and complications of percutaneous kidney biopsies in 715 children and 8573 adults in Norway 1988-2010. Clin J Am Soc Nephrol 2012;7:1591-7. Fuiano G, Mazza G, Comi N, et al. Current indications for renal biopsy: a questionnaire-based survey. Am J Kidney Dis 2000;35:448-57. Jamal Q, Jafarey NA, Naqvi AJ. A review of 1508 percutaneous renal biopsies. J Pak Med Assoc 1988;38:272-5. Mubarak M, Kazi JI, Naqvi R, et al. Pattern of renal diseases observed in native renal biopsies in adults in a single centre in Pakistan. Nephrology (Carlton) 2011;16:87-92. Das U, Dakshinamurty KV, Prayaga A. Pattern of biopsy-proven renal disease in a single center of South India: 19 years experience. Indian J Nephrol 2011;21:250-7. Huraib S, Al Khader A, Shaheen FA, et al. 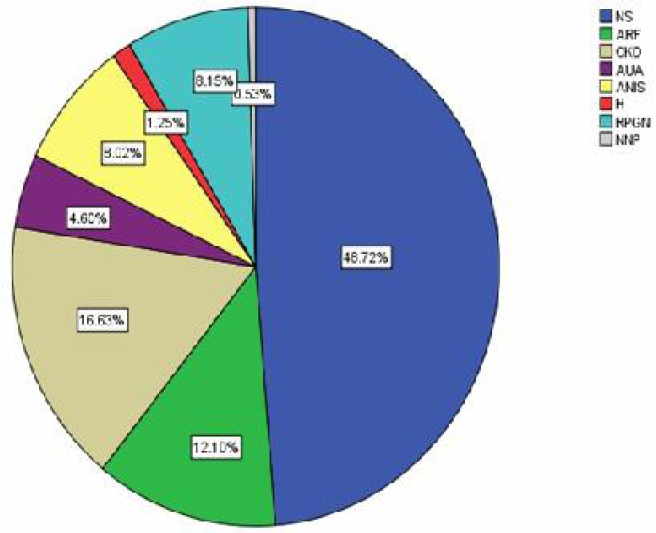 The spectrum of glomerulonephritis in Saudi Arabia: the results of the Saudi registry. Saudi J Kidney Dis Transpl 2000;11:434-41. Nadium WK, Abdelwahab HH, Ibrahim MA, Shigidi MM. Histological pattern of primary glomerular diseases among adult Sudanese patients: A single center experience. Indian J Nephrol 2013;23:176-9. Wang YT, Zhou CY, Zhu TC, et al. Analysis of kidney biopsy data from a single center in the midland rural area of china, 1996-2010. Curr Ther Res Clin Exp 2013;74:22-5. Polito MG, de Moura LA, Kirsztajn GM. An overview on frequency of renal biopsy diagnosis in Brazil: clinical and pathological patterns based on 9,617 native kidney biopsies. Nephrol Dial Transplant 2010;25:490-6. Chang JH, Kim DK, Kim HW, et al. Changing prevalence of glomerular diseases in Korean adults: a review of 20 years of experience. Nephrol Dial Transplant 2009;24:2406-10. Briganti EM, Dowling J, Finlay M et al. The incidence of biopsy-proven glomerulonephritis in Australia. Nephrol Dial Transplant 2001;16: 1364-7. Iseki K, Miyasato F, Uehara H, et al. Outcome study of renal biopsy patients in Okinawa, Japan. Kidney Int 2004;66:914-9. Swaminathan S, Leung N, Lager DJ, et al. Changing incidence of glomerular disease in Olmsted County, Minnesota: a 30-year renal biopsy study. Clin J Am Soc Nephrol 2006; 1:483-7. López-Gómez JM, Rivera F. Spanish Registry of Glomerulonephritis. Renal biopsy findings in acute renal failure in the cohort of patients in the Spanish Registry of Glomerulonephritis. Clin J Am Soc Nephrol 2008;3:674-81. Sugiyama H, Yokoyama H, Sato H, et al. Japan renal biopsy registry and Japan kidney disease registry: Committee report for 2009 and 2010. Clin Exp Nephrol 2013;17:155-73. Pesce F, Schena FP. Worldwide distribution of glomerular diseases: the role of renal biopsy registries. Nephrol Dial Transplant 2010;25: 334-6. Hanko JB, Mullan RN, O’Rourke DM, McNamee PT, Maxwell AP, Courtney AE. The changing pattern of adult primary glomerular disease. Nephrol Dial Transplant 2009; 24:3050-4. Al Riyami D, Al Shaaili K, Al Bulushi Y, Al Dhahli A, Date A. The spectrum of glomerular diseases on renal biopsy: data from a single tertiary center in Oman. Oman Med J 2013; 28:213-5. Ossareh S, Asgari M, Abdi E, et al. Renal biopsy findings in Iran: case series report from a referral kidney center. Int Urol Nephrol 2010;42:1031-40. Yahya TM, Pingle A, Boobes Y, Pingle S. Analysis of 490 kidney biopsies: Data from the United Arab Emirates renal diseases registry. J Nephrol 1997;11:148-50. Khan AZ, Anwar N, Munib M, Shah F. Histological pattern of glomerulopathies at Khyber teaching hospital, Peshawar. Pak J Med Res 2004;43:117-20. Rabbani MA, Memon GM, Ahmad B, Memon S, Tahir SA, Tahir S. Percutaneous renal biopsy results: a retrospective analysis of 511 consecutive cases. Saudi J Kidney Dis Transpl 2012;23:614-8. Haas M, Meehan SM, Karrison TG, Spargo BH. Changing etiologies of unexplained adult nephrotic syndrome: a comparison of renal biopsy findings from 1976-1979 and 1995-1997. Am J Kidney Dis 1997;30:621-31. Mubarak M. The prevalence of IgA nephropathy in Pakistan: only a tip of the iceberg. J Pak Med Assoc 2009;59:733. Gesualdo L, Di Palma AM, Morrone LF, Strippoli GF, Schena FP; Italian Immunopathology Group, Italian Society of Nephrology. The Italian experience of the national registry of renal biopsies. Kidney Int 2004;66:890-4. Qureshi H, Bile KM, Jooma R, Alam SE, Afridi HU. Prevalence of hepatitis B and C viral infections in Pakistan: findings of a national survey appealing for effective prevention and control measures. East Mediterr Health J 2010;16 Suppl:S15-23.